RadioFreeLiberal.com • View topic - C'mon, I know you can do it, PUTIN or Kamala Harris? C'mon, I know you can do it, PUTIN or Kamala Harris? Post subject: Re: C'mon, I know you can do it, PUTIN or Kamala Harris? The link you gave attributed the quote to George Bernard Shaw, it's from a play, THE Serpent was speaking to Eve. He was convincing Eve that getting Adam to eat from the tree of life was a good idea. No Sam. They were supposed to eat from the tree of life. It was the tree of knowledge of good and evil that was forbidden. Bernie... No he's not a Cincinnatus. Not the best role model for Lefties, honestly, as he ruled as a dictator in Rome, and he and more particularly his son fought for the privileges of the patrician over the plebeian caste. BTW, I got one more question. Why is Harris' LIFT Act, which gives tax relief to working and middle class people (much like the EITC already does), a crazy unsustainable "giveaway" whereas Trump's tax bill, which gave tax relief to the wealthy and corporations, not one? How come the person who went after the LIFT Act isn't talking about how much of a handout and loss of revenue the Trump tax cut bill was? 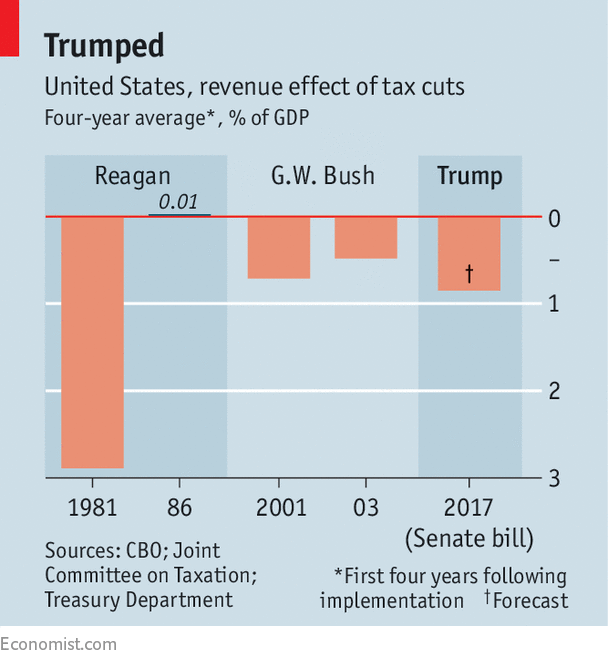 So, it's not as bad as Reagan's tax cuts, but ... oh, and the source is this left-wing agitprop rag known as The Economist magazine. Thats not what I said. I would vote for the candidate that I felt was qualified for the job and best for my country. I also said I would prefer to vote for a candidate that did not represent a party full of people who considered me a mortal enemy. Would YOU vote for a candidate that represented a party of people who considered you a mortal enemy? If you hate Conservatives and Republicans, why do you even care what we think or how we vote? You clearly don't have our best interest at heart; after all we are your mortal enemy according to you. I'm not sure I would be basing my decision on candidates on advice from someone who considers me a mortal enemy. Libertas, I've been getting a lot of them. I've Googled for more information but haven't been getting enough information to sort them out. 668366 is an SMS short code. I don't know what it means other than they are automated list dialing commands which can send texts to thousands in seconds, there are a lot of those codes. Trumpia is pushing them. "Trumpia's automated communications platform is the most complete texting solution. Now, send the right messages to the right people at the right time - all automatically." I found a directory but it doesn't say much except to say who owns those spammers codes, MoveOn does own that one. "88022 is being used by Donald J. Trump for President, along with email, to keep supporters updated on the organization's activities, missions and objectives. The short code is also used to solicit action when needed from SMS subscribers, as is the case when it's time for a political organization to get out the vote. Many political organizations similar to Donald J. Trump for President, have used their vanity short code short codes to solicit and collect donations from supporters. Barack Obama and Mitt Romney were the first political candidates to start accepting text message donations, back in the 2012 presidential race. In the 2016 presidential race, both Ted Cruz and Bernie Sanders have used text messaging to solicit donations from their supporters." I don't know why I'm getting whole spammer messages which are made up of nothing but those codes. One of them I got has about ten of those codes jumbled together ending with an "Amen." Amen was the only word in the whole message I could read. I hope God's pleased, I know I'm not pleased. Except for the "amen" this could have come from Russian Intelligence. The chances of this are very, very low, but they do still use the old 5-figure-group codes like in WWII. Quantum tables have replaced spinning wheels for the crypto keys, since they're the closest thing to true randomness in the universe. Typically these have a one time pad cipher, and since US law enforcement has seized pads in the past, we know they do use this. Back in the real world, though, they're probably SMS codes. I would be afraid to find out. I wouldn't want to probe that mess either. I encoded it myself. If you want to know what I said to you, you'll have to break that strong code. The experience would be biblical. Use biblical tools. Mat 10:27 would be a hint. Be a Greek. If you really want to see a strong code take a look at any NFL play book. I had suspected they might have play books. Glen there are languages which have a built in numeric lexicon, every word is also a number. Fun code stuff can he had with a language like that, because the language itself has a cipher. Ancient Greek and Hebrew are examples I know of. Heads and tails over pig Latin. What else you got as far as KH's supposed extreme leftist "beliefs" that destroys the country on the same level as the head of a hostile foreign government? Extending the Earned Income Tax Credit to more people is UNABASHED BOLSHEVISM! As far as glen is conerned, Ms. Harris is being Uppity. glen will never be able site any real specific "Things" Ms. Harris might do. Except for the tax credit ($6,000.00 as opposed to the lie he told of $50,000.00). Come on glen, you make the outrageous statements and then run for hills when confronted with your lies. Fixed Lies forced to apologize after showing images of Senator Kamala Harris (D-CA) as a possible murder suspect. She's Black, She's Strong....She must be guilty of something. Ms. Harris will become next target of RePuBliKlans and she will be attacked just like HRC was. Goddamn Kamala Harris Has To Guilty of Goddamn Something Because She Is Goddamn Kamala Harris Goddammit. WTF are you talking about? 6000 for couples earning under 100k 3000 for singles earning under 50k. Glen has no clue what he is talking about, no con does on any topic. Especially business and who is and who isnt successful. glen, you Cons love tax cuts, tax breaks and tax credits. WTF has your frillies in twist....oh its a Democrat proposing it. As the song goes, "Nothing From Nothing Leaves Nothing."